This little novel has a huge heart. If you're a reader between the ages of 10 and 110, read this book! You'll experience heart-break and joy as 12 year old Grover tries to navigate a life turned upside down by the death of his mother. Creativity and a close-knit (Asheville, NC) community help him get through tough days with too many feelings... and Grover hates feelings. Since his mother died earlier this year, Grover Johnston (named after a character in Thomas Wolfe's Look Homeward Angel) has watched his family fall to pieces as his father throws himself into his work rather than dealing with the pain. Left to care for his younger sister, Sudie, Grover finds solace in creating intricate weavings out of the natural materials found in the bamboo forest behind his North Carolina home, a pursuit that his father sees only as a waste of time. But as tensions mount between father and son, unlikely forces conspire to help the Johnstons find their way. The new tenants in the rental house across the street who have come from deep in the Carolina hills seem so different from the Johnstons, but become increasingly intertwined with them in unexpected ways. Classmates, neighbors, teachers, and coworkers band together, forming a community that can save a family from itself. 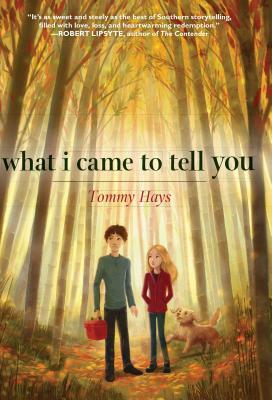 In the spirit of such beloved novels as Newbery Medal-winning Missing May and Because of Winn-Dixie, What I Came to Tell You, the first middle-grade novel from critically acclaimed Asheville author Tommy Hays, is a story of grief, love, and hard-won redemption. Warm, evocative writing blends with an emotion-laden narrative that cuts to the heart of the reader. Tommy Hays, director of the Great Smokies Writing Program, is a lecturer at the University of North Carolina Asheville. He is the author of several well-reviewed adult books; the most recent, "The Pleasure Was Mine," has been selected as a Community Reads in many cities and counties throughout the South. The author lives in Asheville, NC.